The Advant system offers three control packages that provide optimal implementation approaches in the areas of continuous control, discrete device control, high-speed interlock control, sequential and batch control, and supervisory control. The three control packages are Configurable Control Functions (CCF), Taylor Ladder Logic (TLL), and Taylor Control Language (TCL). CCF software provides comprehensive capabilites from a preprogrammed library of functions. CCF configuration uses a menu-driven, fill-in-the-blank approach and does not require programming. This software is suitable for continuous control, device handling, interlocking and alarm handling. TLL provides high-speed ladder logic control processing. It is suitable for device interlocking, motor control, and drum programming device sequencing. TCL is a structured block text, high-level procedural language. It is suitable for sequential/batch control, complex arithmetic and logic functions, supervisory tasks, and serial interfaces to third-party equipment. 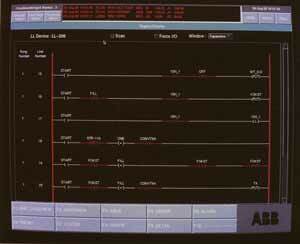 ABB Automation Inc. - HPI, 29801 Euclid Avenue, Wickliffe, OH 44092. Tel: 800-626-4999; Fax: 614-261-2172.